Flyball is a fast paced, exciting team sport for dogs and their handlers. Flyball was invented in California in the late 70’s. Legend has it that Herbert Wagner first showed it on the Johnny Carson Show to millions of Americans. Soon afterwards dog trainers and dog clubs were making and using Flyball Boxes. In the early 80’s the sport became so popular that the North American Flyball Association (NAFA) was formed and became the worldwide authority for Flyball. Flyball is a relay race with 4 dogs on a team racing another team of 4 dogs at the same time. The team dogs are released one at a time and must jump over 4 hurdles, trigger a box loaded with a tennis ball that the dogs must catch, and return over the same 4 hurdles, with the ball, to a finish line where another dog is waiting to be released and the process is repeated until all 4 dogs have run. 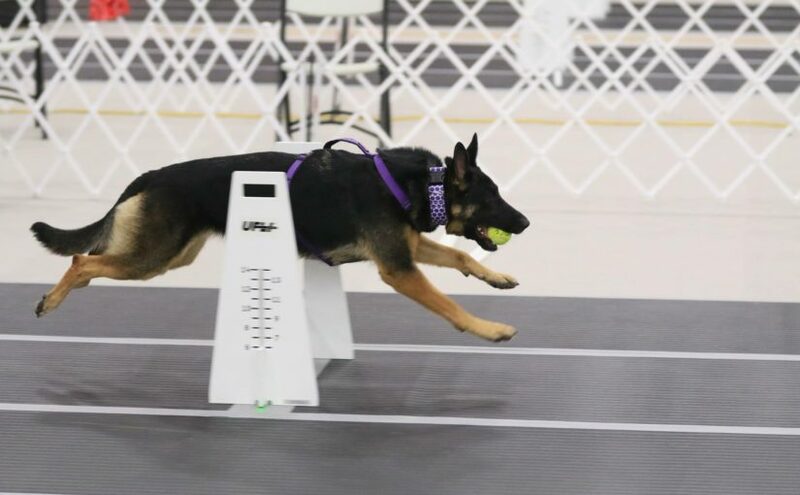 The fastest team with a clean finish, meaning the dogs jumped all the hurdles, and successfully triggered the box to release the ball, and returned with the ball, win the race. Dogs love the running and competition; they often can get very vocal as they watch the race. The Flyball team at POTC participates in UFLI (United Flyball League International) tournaments around the country and Canada. POTC offers training in Flyball to POTC members. Practices are, usually, Sat. mornings at 7:30am when the building is not occupied with trials or the team is not away at tournaments.